Little Red Rooster is a family run diner. After visiting New York we fell in love with the laid back friendliness of the local diners. Along with the food, which was amazing and all made in house, we realised this was the kind of thing we wanted to create in Falmouth..
One day we spotted a little derelict building on Bar Road, Falmouth. We thought that this might be a good place for a local diner so began designing and building our dream. We opened in March 2016 after spending years researching great authentic American food. We have all the dishes expected from a diner…..great American breakfasts, burgers, hot dogs, delicious sides such as mac & cheese and amazing desserts and sundaes. 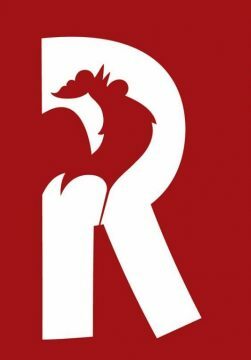 The difference with Little Red Rooster is the time and care taken to create every item on our menu…. We love our blues music and Southern food, so our blues themed burgers, such as ‘Smokestack Lightning’ and ‘Goin Down Slow’ are all made in house, some of which contain our house made chutneys and sauces such as the very spicy ‘Boom Boom’. Our sticky BBQ ribs are cooked for 7 hours till they fall off the bone and are now one of our most popular menu items. 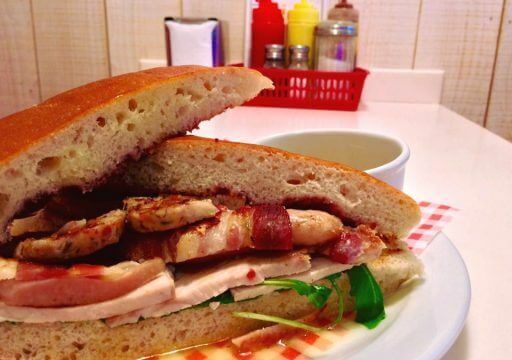 Our southern fried chicken, pulled pork and roasted ham are all made in house and used to create amazing sandwiches. We are also famous for our weekly specials and incredible desserts, our huge lemon meringue pie being a favourite with locals, many of which just come in for a slice of pie and coffee. We love catching up with our regular customers and chatting to holidaymakers who visit. It is great to see our customers enjoying our food and appreciating the care and time it has taken to create it. We are very family friendly and have become popular with kids, we have a great kids menu which was designed by local children and all the essentials such as baby change facilities and plenty of colouring sheets!! Whether it’s for our great food or just a coffee and warm welcome, we hope you will pop in and say hi!